Once the better half of a Whirlpool Duet, my poor dryer is left to sing his Solo. Oh, you’ve read about my girl before. She’s been my joy — and the bane of my existence — for the past eight years. 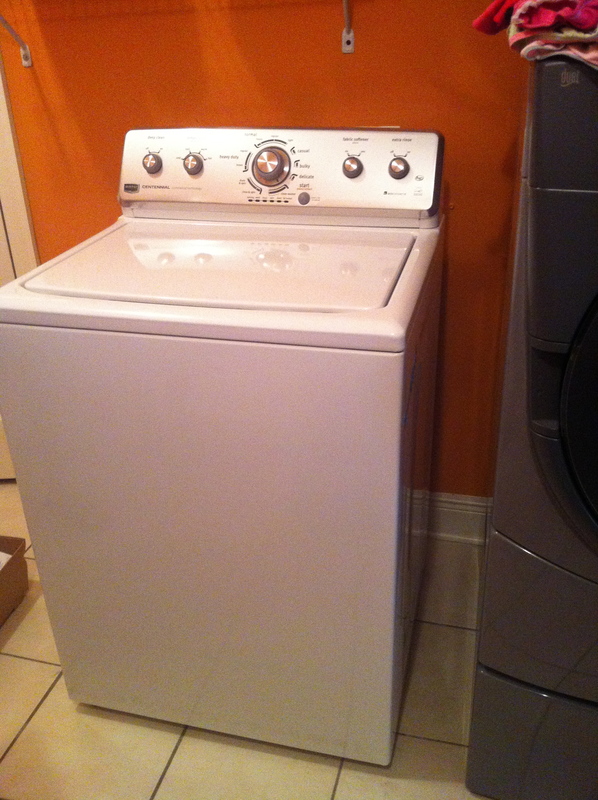 You might think it odd for me to write about my washing machine… twice. But that old girl was an integral part of our lives. For a family with 4 kids, 2 dogs, various and sundry rodents, and a great deal of visitors, there are two appliances that I simply cannot live without: my washing machine and my Dyson vacuum. I’ve never blogged about my Dyson. She’s never given me a reason to. She just does her job every day, sucking dog hair out of the furniture, sucking crumbs from under the table, making me happy in all her purple glory. But my washing machine. Oh, my washing machine. When she was good, she was very, very good. And when she was bad, she was horrid. That girl could wash the biggest load of clothes imaginable. She was pretty, she was fast, she was fickle. And when she was fickle, she either cost a great deal of money or she caused my husband to unleash an impressive string of profanity-laden verbiage. I loved her. I hated her. Last night, I noticed strange bits of an unknown sticky substance clinging to everything that came out of her. I assumed it was a stray piece of gum or a half-chewed Laffy Taffy or some other expected treat that one of my children had obliviously left in a pocket. But as I continued to change loads, the sticky mystery remnants multiplied exponentially. Pieces were stuck to lacrosse jerseys, were embedded in socks. Then my girl began to complain. She shook, she shuddered, she wailed. She begged for mercy. But I had clothes to wash, damn it! So I continued to push her to the limit. Chris cajoled. He tightened screws. He drained hoses. She was not impressed. I opted not to go in. “This doesn’t look good,” Chris said as he emerged from the orange room of death. “How much is it going to cost?” Always my first thought. Always. And so he mopped the floor, put the last load of darks in, and we sent the kids off to bed. “But I don’t think the kids are going to be sleeping any time soon!” he yelled. I was only three feet away, and we could barely hear each other. And he was right. That load was her last. She left lots of plastic remnants on that final round of darks. I spent a great deal of time picking the shredded plastic tub parts out of my kids’ underwear before I threw them all in the lonely dryer. This morning, we went to Lowe’s in search of a replacement. This time, we were not one bit worried about aesthetics. We were only concerned with sale price. We found an unassuming Maytag for a fair price. We weren’t ready to introduce another Whirlpool to our home. It’s just too soon. So, I gave the cashier my debit card and a little piece of my soul. We’re embracing diversity here in Starkville. I think we’re gonna keep her. This entry was posted in Me Myself And I, My Kids, We Are Family and tagged appliances, Dyson, Lowe's, Maytag washing machine, vacuum, Whirlpool Duet. Bookmark the permalink.